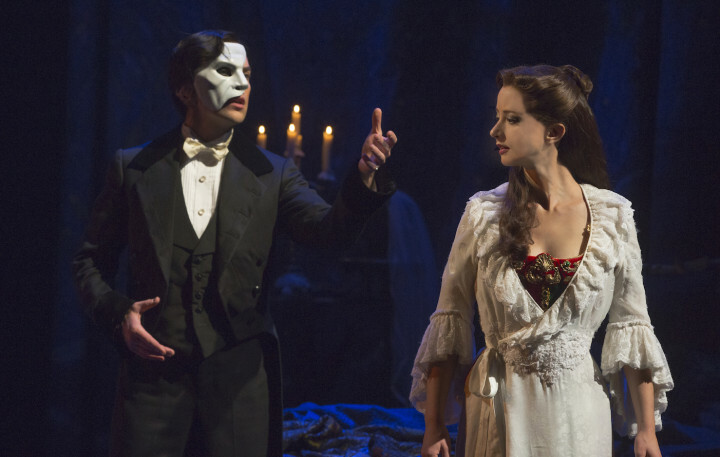 Cameron Mackintosh’s spectacular new production of Andrew Lloyd Webber’s The Phantom of the Opera rolled into Omaha last week and I had the privilege of seeing the show last Thursday. This show was a total bucket list item for me and I am thrilled to be able to check it off my list. Last week I wrote more about the production. It is filled with fun theater facts about the size of the production, costumes, wigs, lights, and the famous chandelier (it weighs 1 ton!). If you want to theater geek out with me hop over and check it out here. This post is my follow up and to be honest it is hard to put that experience in to words. I wish I had more photos to share with you but I am such a rule follower and didn’t snap any photos during the production. In high school I used to listen to the soundtrack all. the. time. I kind of forgot that I actually knew most of the words to all the songs. As soon as the Overture started and I heard the first chords from the organ I had goosebumps. GOOSEBUMPS! I knew I was in for an exciting ride. How strange it was to be familiar with the songs but not the story line connecting the songs together. If you saw the old Phantom it would be worth your time to see this new production. The revolving sets were mesmerizing. Honestly the giant revolving set was like a character in the show. Changing “costume” for every scene. You see the stairs in the above photo? 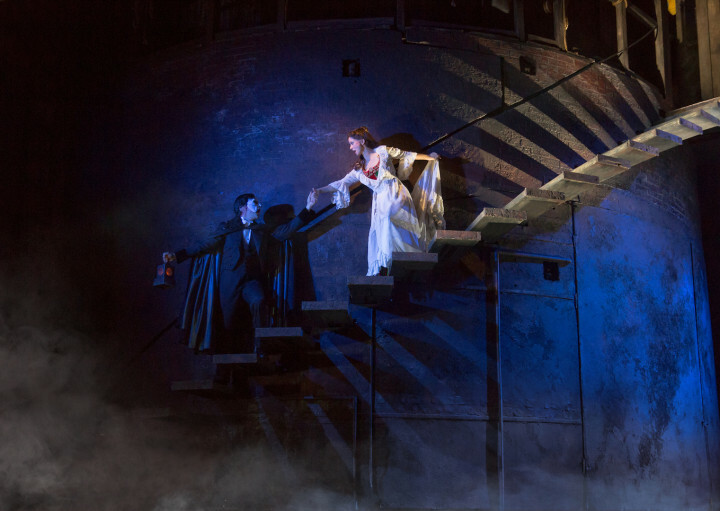 They came out of the wall one at a time as Phantom and Christine descended the staircase. Then when it was time to change scenes the huge column divided and inside was the Phantom’s lair. And for all you pyros out there there was fire in this new production. And lots of it. Fire and sparks. I jumped every. single. time. The Chandelier was gorgeous but I wasn’t at the right angle to fully appreciate it. But the sparks made me almost just out of my seat. The singing, acting, and dancing were superb. I had no doubts about that. Each member of the cast had such pure and powerful voices. 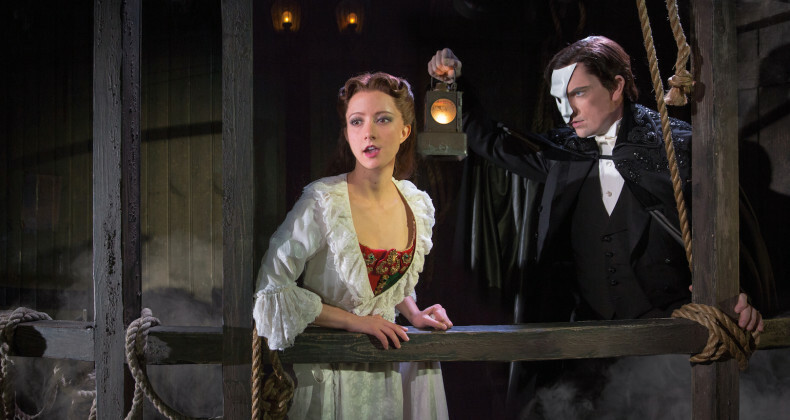 It is no wonder that The Phantom of the Opera has such fame. It is rightly deserved. Good news is you don’t have to travel to Broadway to experience the excitement yourself. The Phantom will remain in Omaha until Sunday, May 1. 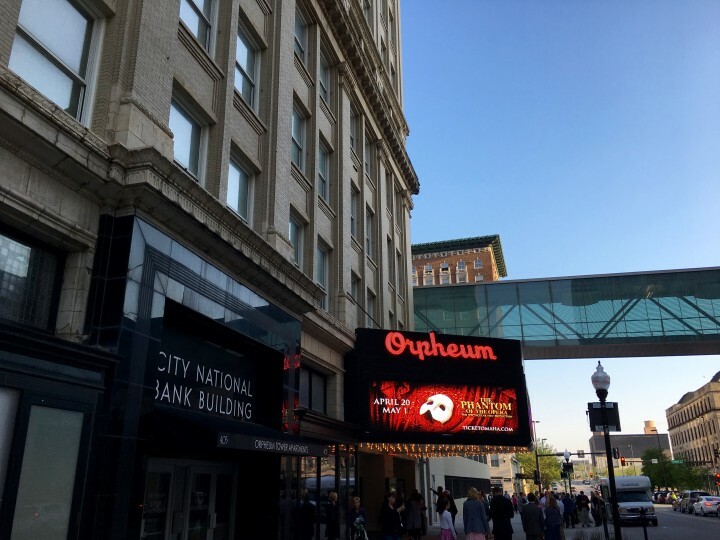 A big thank you to Omaha Performing Art for bringing The Phantom of the Opera to Omaha and keeping alive The Music of the Night. I will think of you (the show) often.  Get your tickets today!